William M. Taylor (1829–1895), a minister at the time of Spurgeon, is relatively unknown. He was an American Congregationalist, born at Kilmarnock, Ayrshire, Scotland. He graduated at the University of Glasgow in 1849, and at the divinity hall of the United Presbyterian Church, Edinburgh in 1852. He was pastor of churches in Britain until 1872 (for 17 years in Liverpool). He entered the United States where he became pastor of the Broadway Tabernacle (Congregational), in New York until 1893 when a paralytic stroke caused his retirement. He lectured at Yale in 1876 and at Princeton in 1880. Taylor’s lectures run 12 chapters, and the work is about 300 pages. He is mainly interested in covering a broad range of topics in relation to the Ministry of the Word, rather than giving a full course on homiletics. No book on Pastoral Theology actually covers everything, and Taylor chooses to cover those aspects of the ministry of the word that are most important, or most neglected in his day. I found the work as a whole to be a little verbose. But there are some very important aspects in his work which I will bring to light that others do not cover in most books on pastoral ministry; such as Taylor’s excellent section to reading the word of God publically, which I found exceedingly important, and possibly is the most neglected aspect of pulpit preaching and ministry. The ministry is “winning souls” and the minister must say “this is the one work I do.” He must, then, focus his whole heart and life on the pulpit. This is not an easy task, and should not be taken lightly. Taylor says, “If, therefore, young gentlemen, you have chosen the ministry, expecting to be carried to heaven “on flowery beds of ease,” you have made an egregious mistake.” The Gospel ministry is work. And to put on habits which will cause success is a hard work. The ministry is primarily and pre-eminently a work of service. Taylor says, “The people are not for the minister, but the minister is for the people; and he is to lose himself in their service and for their benefit.” The office of the preacher is that of a helper of his fellows. His special duty is to lead them to Him who is their Helper and Redeemer, and to assist them in the understanding of His word, and in the application of its principles to their daily lives. The minister holds steadfastly that he is there for the flock, and self-renunciation is the root of excellence in his office. Everything that the minister does comes down to speech in some way or another. The minister takes the word, and applies that to various duties in his pastoral office: the ministry of the word in preaching and prayer, and the ministry of the word in visitation, catechizing, comforting, admonishing, discipline and the like. The minister is to take the word of God and bring it in a lively manner to the people. Taylor says, “If we be ourselves uninterested, how can we expect to interest others? If we be ourselves insincere, how can we hope to bring others to the faith? If we be ourselves cold, passionless, and dull, how can we expect to rouse others to enthusiasm?” But, even personal sincerity will not benefit without the co-operation of the Holy Spirit, and so the connection between prayer in the closet and power in the pulpit is of the closest sort. He preacheth best who prayeth best. The first charge the student of the ministry has is seminary. This should be a time of prolific study, and hearty learning since the ministry itself, once seminary is ended, will take up a great deal of time. The minister will not have the time to study as he did in seminary when he is in the ministry. Take advantage of it. Among those things which are needed to the furnishing of a successful preacher, I would give an important place to the study of the works of standard authors. Paul said to Timothy, “Give attendance to reading,” and the advice is even more needed in modern times than it was in the days in which he lived, for now “many are running to and fro, and knowledge has been increased.” Taylor says, “If the minister is to be a leader of men, he must keep ahead of them, or at least abreast with them in ordinary intelligence, for, if they detect him blundering in matters of history, philosophy, or literature, or if they discover that he is comparatively ignorant in these departments, they will have little respect for his opinions and small confidence in his judgment, even when he is speaking to them of things that lie within his proper province.” Otherwise, the preacher will show himself in his mental barrenness. Yet, the minister must guide his intellectual strength not by the number of books he has read, but the number of books he has digested. Proportion an hour’s reflection to an hour’s reading, and so dispirit the book into the student. Also, consider writing out and journaling what you read and study. Writing places the material in the mind. Do all this in the most suitable way, so as not to waste your time, and take the shortest and best way to your intended end of study. The preacher should take time to cultivate elocution. Seek first distinctness of articulation. Do not mistake loudness for clearness. Do not speak too rapidly, allowing the hearer to keep up with you. Cultivate the art of appropriate emphasis. Emphasize according to need. All this must be spun together into one focus by the intense love which the preacher has, on the one hand for the Lord Jesus Christ, and on the other for human souls. 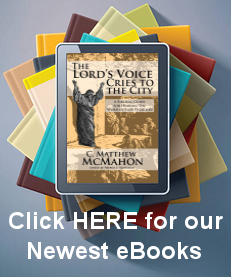 The special work ministers have is the preaching of the Gospel. Paul defines the Gospel to be the setting forth of Christ Jesus by God, “to be a propitiation through faith in His blood, to declare His righteousness for the remission of sins that are past, through the forbearance of God, to declare at this time His righteousness, that He might be just, and the justifier of him that believeth.” The minister must communicate, if we would be effective preachers, “Who is Jesus, that I may believe on Him? And, what was there in His dying that has any relation to me?” Many will say, “Preach Christ, and leave doctrines alone.” But how is it possible to do anything of the kind? The word Christ is not a mere abstraction. It is the name of a person, and if we attempt to tell who or what He is, we are giving forth a doctrine about His person. Preach doctrine, yet do not proclaim it as if it were the Savior, but let your doctrine define the Savior to the minds of those who wait upon your ministry. The truth is, that the Gospel is related to everything which affects the happiness and the holiness of men; and its minister not only may, but ought to show its relations to these things in his discourses. Effective preaching convinces the intellect, stirs the heart, and quickens the conscience of the hearer, so that he is moved to believe the truth which has been presented to him, or to take the course which has been enforced upon him. This result cannot be produced without the agency of the Holy Spirit. The sermon is the most important means to this end. What are the qualities of an effective sermon? Taking those which are in the sermon itself, I name as the first, definiteness of aim; or in other words, precision. Every sermon should have a distinct object in view. One must preach, not because the Sabbath has come around, and he has to occupy the time somehow, but rather because there is something pressing on his mind and heart which he feels impelled to proclaim. Have precision of language. The relation of style to thought is of the closest kind; and the aim of the preacher should be to get the clearest possible medium for the transmission of his thought. How? This happens only, in my judgment, by the careful writing of every sermon. Taylor says, “It seems to me that the importance of the work we are engaged in demands this exactness of written preparation at our hands.” If the minister does not write his discourses, the result, in ninety-nine cases out of every hundred, will be that he will write nothing at all, and then his sermons will become like Gratiano’s reasons, having about a grain of thought to the bushel of words. He must cultivate precision of language. And in writing things out in this way, each portion of the sermon will have its due course of attention. Taylor says, “It is, therefore, with the strongest conviction that I am giving you the best possible advice, that I say to you, write your sermons. This will give precision to your language more effectually than any other process.” This will help you consider the precision and clarity of the arrangement of the sermon. First, the quality that is often neglected and needful is earnestness. If we have not made up our minds upon a subject, we cannot kindle into enthusiasm over its treatment. If you have no convictions on subject matter, you will settle nothing in the hearer. In the pulpit, when the salvation of souls or the benefit of men in some special direction is the uppermost object in the preacher’s ambition, earnestness will come unsought; but without that it can never be attained. We shall always do most, my young brethren, when we are directly seeking to save souls; but when we are working only for display, we shall inevitably fail. All your words will be made to converge toward the great result on which your heart is fixed, and there you must exercise courage. The preacher must be unafraid of the hearer, knowing, “the fear of man bringeth a snare,” (Prov. 29:25). Given burning earnestness, unflinching courage, and sympathetic tenderness in the preacher, all other things may be very safely left to take care of themselves. Should you memorize your sermons? Abstractly, of course, there can be no doubt that free speech is the normal method for the pulpit. Yet, some great preachers have written their discourse fully, commit it to memory, and deliver it verbatim. This plan has been supposed by many to involve tremendous drudgery. Instead, use a manuscript with effect. On the whole, this is the best use of the minister’s talents, and makes the fewest failures. You should educate yourself into the free and unfettered use of a full manuscript. Not that the preacher is reading from his manuscript, but that he preaches from his manuscript. Expository preaching is that method of pulpit discourse which consists in the consecutive interpretation, and practical enforcement, of a book of the sacred canon. It differs from topical preaching which may be described as the selection of a clause, or verse, or section of the inspired Word, from which one principle is evolved and kept continuously before the hearer’s mind, as the speaker traces its manifold applications to present circumstances, and to human life. Doctrinal preaching prosecutes a system of Biblical induction in regard to some great truth, such as justification, regeneration, the atonement, or the like, gathering together all the portions of holy writ that bear upon it, and deducing from them some formulated inference. Hortatory preaching sets itself to the enforcement of some neglected duty, or the exposure of some prevalent iniquity. Biographical preaching takes some Scripture character for its theme, gives an analysis of the moral nature of the man, like that which Bishop Butler has made in his wonderful discourse on Balaam, and points from it lessons of warning or example. All however, have expository elements to them. Exposition must enter into every sermon. Consideration should be made to the mind of the Holy Spirit in relation to the passage being exposited. The preacher’s job is to bring the mind of the hearer into direct and immediate contact with the mind of the Spirit. This is where the power of the pulpit exists. Such preaching will promote biblical intelligence among the hearers. Some will object, “Expository preaching is not popular. The people do not like it, and they will not stand it.” Yet, only biblical exposition will impart what the hearers need, and this is the service of the minister to accomplish. There is a danger now is where sermons consist of illustrations, and nothing else. Such things hide the poverty of thought for the minister, and are a snare to him, while being an offense to the hearer. Here is the one rule to follow on this point, that we must never construct ornament, but only ornament construction. Impressions made in this way are produced and never forgotten. Learning to illustrate is learning to see. Keep in mind that the common people wanted to hear Christ and they did so gladly. Many exalt the sermon at the expense of worship. The main responsibility falls on the preacher in the service. It is pertinent to remind you that the first grand indispensable qualification for the leading of public devotion is a filial heart. Robert Leighton said, “This is one great cause of our wandering, that we do not, at our entrance into prayer, compose ourselves to due thoughts of God and to set ourselves in His presence; this would do much to ballast our minds, that they tumble not to and fro, as is their custom.” The minister is to bring people to the throne of grace, the place he has visited all week long in his closet and study. In this, the minds and hearts of the worshipers may be rightly affected as they draw near to God. Extempore preaching may do for some, but extempore reading is impossible for anybody. Of course it is easy to name the words correctly, but that is not reading. That is only accelerated spelling. Reading is the presentation through the voice of the thoughts which the sacred author has put into words: and for that, study is indispensable. You might as well expect an actor to give a perfect presentation of a character, on his first reading of a play, as imagine that a preacher can, without previous preparation, give a proper rendering of any passage in any author, how much less in a book so many-sided and suggestive as the Bible. Always prepare yourself for this exercise, therefore, and at length your reading of the Scriptures may be as effective in the conversion of sinners, and the edification of the people of God, as any sermon. The minister should read the passage distinctly and intelligently, that it may stand clearly before the minds of the people in its own unapproachable sublimity. In a Scottish congregation few sounds are more inspiring to the preacher than the rustle of the leaves of hundreds of Bibles, as he bids his hearers turn with him to a passage which has an important bearing on his argument, and the corner pressed down, as he finishes his remarks, indicates that the owner of the book means to study it in the leisure of his closet. When you can get your people to use the Word of God in that way, both in the sanctuary and the home, as the testimony to regulate their faith and the law to rule their lives, your ministry will be a success. This particular chapter did not afford me as much information as I would have wanted, and Taylor was more akin to seeing his congregational worship as a mirror of his day. They used instruments, sang uninspired hymns and such, and he covers his church’s use or abuse of worship in this way. Taylor says, “Finally remember, that the best praise comes after a living sermon.” Also, “Every earnest minister will tell you that the prayer gives the tone to the entire service. It is the key of the position. It holds in itself the success or the failure of the day.” Prayer is exertion, and it is a hard work. The minister should not pray simply to allow his hearers listen to his soliloquy. Prayer is a direct address to God, and any reflex action of the soul as it muses on some phase of its own experience, or moralizes from it, is out of place in such an exercise. Prayers should be definite, direct and real; not artificial. They should be in some parts intercessory and not merely selfish. The pastorate and the pulpit react on one another, and are joined to one another. One cannot happen without the other. There are some men of whom you would say, as you listen to their sermons, that they should be always in the pulpit; but when you meet them in private, you are constrained to declare, as you listen to their conversation, that they should never be in the pulpit. Let it not be so with you. Do nothing in your life to wipe out the impressions made by your sermons. You are to move your people by influence, not mere authority. Concerning visitation, the pastor’s first care should be for the aged, the sick, the bereaved, and those who are suffering from any kind of trial. Do not think of such work as if it were a task, or even simply a duty, but esteem it a privilege, and seek, “to lift up them that are bowed down.” Let the sick one and his nurse feel as if a ray of sunlight had come in to gladden them. You will make a great mistake if you undervalue the visitation of your people. The pulpit is your throne, no doubt; but a throne is stable only when it rests on the affections of the people, and to get their affections you must visit them in their dwellings. Taylor says, “He who would be successful in the ministry of the Word must give himself wholly to it.” The Gospel which we preach is the only remedy that can meet the manifold evils of society. The only thing which can regenerate society is that which can regenerate the individual heart:, the power of the Holy Spirit working in and through the belief of the truth as it is in Jesus. Taylor says that if opportunity were afforded me, I would choose again to be a minister of the Gospel, only with more enthusiasm and self-sacrifice than ever. Henry Martyn said, “Thank God, I am Christ’s minister.” Christ’s minister. Let that thought fill your souls, and then your service will be of the best. Forget yourselves. Seek only and always the good of souls and the glory of the Lord, then added to your own happiness will be the joy of every one whom you have brought to Christ; and in the end, “When the chief Shepherd shall appear, ye shall receive a crown of glory that fadeth not away.” On that day may I be a witness of your happiness and a sharer of your reward! 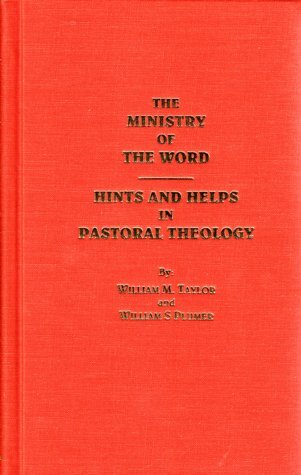 Taylor, William M. The Ministry of the Word, (Harrisburg, PA: Sprinkle Publications, 2003) 2. Ibid. Consider John 3:14-16, 12:32; Romans 3:25-26; 1 Cor. 15:3-5, 1:23; 2 Cor. 5:21, 2:2. Page 139, cf. Acts 4:31 and 20:27. Page 210, quoting the Works of Robert Leighton, 452. Page 247. This definition is a little weak, but commendable in some ways.